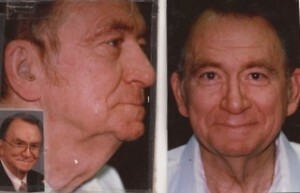 No these are not “mug shots!” On February 18, 1988 Dad got the final costs of a “face lift.” The cost for the “lifting,” and “tucking,” of all unwanted, sagging skin on his neck, brow, eyes, and cheeks was $7200.00. He evidently got a discount (normal for Dad) because to do just the brow lift and both eye lids were $4400.00, and to just do the face and neck-lift were $4400.00. The before and after are pictured here (the after is the small picture). Sometimes we just need to do something with our face. “It is said that Abraham Lincoln, when he was President of the U.S., was advised to include a certain man in his cabinet. When he refused he was asked why he would not accept him. “I don’t like his face,” the President replied. “But the poor man isn’t responsible for his face,” responded his advocate. “Every man over forty is responsible for his face” countered Lincoln” (Resource, July/August, 1960). Not everyone has the money for a face-lift. Face-lifts are not always the answer to a person who has more scars on the inside than on the outside. There is a cheap face lift however that all can put into practice… smile. Sin takes away the smile and joy of life. King David experienced a terrible time in his life where he was at the wrong place, at the wrong time, and looked at the wrong woman too long. 2 Samuel 11-12 records the story if you wish to read. Everyone knows he committed adultery physically with her and had her husband murdered on the “front line,” to try and cover it up… Few people pay attention to the fact that this took place in his heart before it took place physically. Jesus said, 27 “You have heard that it was said, You shall not commit adultery.’ 28 But I tell you that anyone who looks at a woman lustfully has already committed adultery with her in his heart” (Matthew 5:27-28). Then he follows this with talking about cutting out an eye if it is going to cause one to get to hell. The idea of course is controlling OUR THOUGHT PROCESS. According to Jesus, there is not much difference in adultery dreamed of and adultery done. With David, with all whose face reflect the pain of a life of sin… much could have been avoided with just controlling the THOUGHTS, for it begins and takes place in the heart first! David did pay with a lifetime of heartache. The prodigal… I imagine he did do a bit of kicking himself and wishing he never did what he did. The point is, that grace and forgiveness cannot be earned. 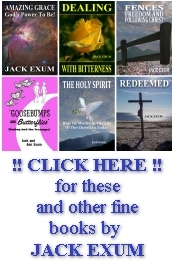 There’s not enough goodness in good works to pay the price of “pay-back” for sins done. Grace is bigger than has been portrayed by many pulpits… It cost $7200.00 for Dad to get his face lift… and he had to pay for it. IT COST JESUS paid for OURS with his life on the cross. The results of what doctors can do are truly marvelous. The results of what Jesus can do in a person’s life is even more remarkable, because it is a change that gets better with time. Physically, the skin will sag again with time. Spiritually, grace gives a song to the lips, a smile to the face, and hope to the heart that cannot be taken away. Grow in grace! Let Jesus offer of GRACE be heard in our pulpits! Children are weird in a lot of ways. They are full of emotions, ‘vim and vigor’. They do things they often regret or get embarrassed about. I was no different. It happened in Sherman, Texas, and I was about ten years old, I had just come home from school. It was a sunny day, and I went into the house, and called out, “Mom, I’m home.” No sound of mom or anyone. It was unusual for me to come home and find no one there. We were still living in the days when a family could live on one income, and be happy. I went into the kitchen as was my custom, to raid the refrigerator, and hopefully find some Twinkies, or a piece of apple pie. No luck… dad got there first. I was disappointed and so I went back in the den and shut the door. Then I found it… a case of beer. You just cannot imagine what went through my mind. Now, as dad told me later, when we could laugh about it… Sherman, Texas was in a “dry county”. That means simply, NO ALCOHOLIC BEVERAGES ALLOWED. Dad of course was the preacher for the Church of Christ and was pretty well known, since he was writing books and doing personal work and visiting the hospital regularly. I was terrified, and thought that dad gone out and bought this case of beer, and had become an alcoholic. Well, I have to confess I went a little crazy. Being the oldest son, a new Christian, and determined to save dad’s reputation, I took this case of beer, all 24 cans, out on the driveway, and a ice pick, ion very plain view of anyone driving by, and started punching holes in each and every one of those cans. Of course since they were warm, and a bit shook up, these cans didn’t ‘go quietly’. They sent beer spewing several feet into the air. One by one they went off like ‘old faithful’. I was covered in the stuff, and the drive way smelled and everyone who passed by couldn’t believe what this ten year old boy was doing much less the smell that was in the air. It’s not over… then mom and dad came home!!! What does a boy do? Pray!!! Well, in the end, dad had been teaching a man who was destroying his family with drinking and he had convinced him to give up the beer. Dad was going to get rid of it for him. I guess, my motives were the only thing that saved me that day.